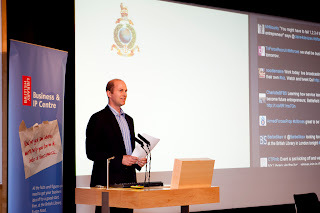 On Tuesday I was asked to join speak on "Inspiring Entrepreneurs: From Battlefield to Business" at the British Library. Following a keynote speech from Clare Perry, the MP for Devizes Matthew Rock from Real Business, who chaired the event, introduced me, Peter Fitchett of Absolute Rubbish, Sarah-Jane Hill of Bish Bosh Becca and Mark Palmer of Green & Black's. You can see the full webcast of the event here. My presentation starts at 17:17. I'll explore each of these tools in more detail in following posts. After the presentation we faced questions from the audience and also via twitter from the online viewers. I asked what tools other people would recommend and "Mentor" was a frequent suggestion - what additional tools would you suggest? Looks like a great list! I would only add Market Research (if not already included under Marketing) as this is probably one area which people underestimate time and time again. Entrepreneurs like to "run" with an idea and sometimes the Market Research as seen as an obstacle as opposed to something which should support your moves, particularly before you start pouring money into the project. Is it allowed to set up a company whilst still in the forces? Saw you at battlefield to business and am inspired! Hi Will - I believe you are generally permitted to set up a company in the UK while still serving in the armed forces, but you should certainly check to ensure that the specific conditions of your service and any clearances you have etc do not forbid or limit this in your case, and also that the company you are thinking of setting up does not create any conflicts of interest. I recommend you check with your chain of command or with a lawyer.